Capadia Designs: Cute Tile Airplanes ... but can they fly? 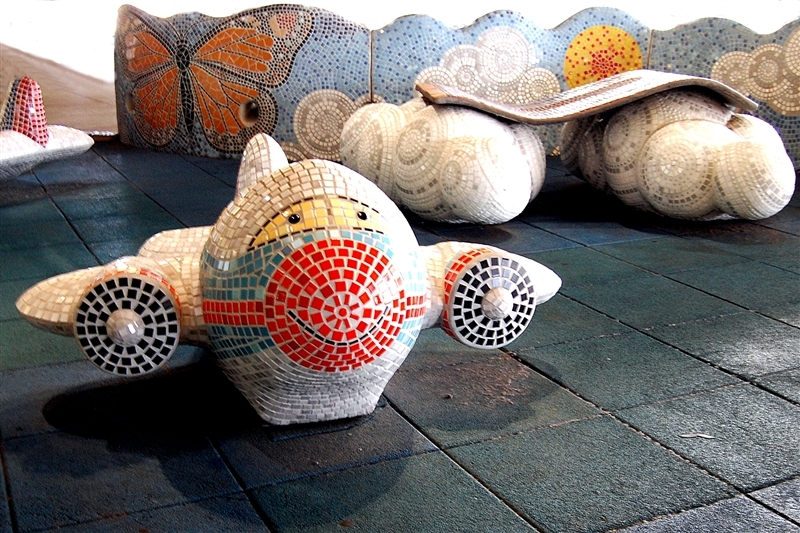 This tile sculpture/play area was one of the first things I saw when I arrived in Nashville. There were a couple of planes, a magic carpet on "clouds" and some butterflies, kites and other things that fly in the mural along the wall. The conference was great. I learned about some new things and now I have a lot to think about regarding some future plans for my blog. I got home late and unfortunately, my seatmate sneezed, coughed and blew her nose for most of the flight. I am sorry she was sick and I hope I can avoid catching whatever she had. I think that there will be some new sales starting at Creative Charms today - I will be sure to post them when I have the details. Right now I need to get some rest. I hope you have a great day! That little plane is so cute! Take lots of vitamin C and get rest to fight off any germs. I started following you last year, but I had never seen a vinyl post by you. Today at the end of your blog there were suggestions on what I might like to read from your blog and the vinyl post appeared. It was so detailed, that's something I have been scared to try, could not quite figure out the transfer tape and how to actually do it, but your pictures were fabulous. Of course I would not use ds with a circuit, since I got rid of all circuit stuff, but will either use my cameo or zing with my make the cut. I will start with a tile! Thanks! What a darling sculpture/play area. Makes me wish I was little again! Take care and I hope you don't catch what your seat mate had. Poor thing...both of you! Glad your conference was inspiring. Hope you don't get sick either. It has been so warm here in Tennessee maybe it was just the pollen as we seem to have lots of it already. I don't remember ever have daffodils blooming at the end of January before but I did this year. Look forward to what all you learned.